Are you simply unable to travel without your smartphone and a broadband connection? Take heart: under the right circumstances, you don't have to leave home without your phone. 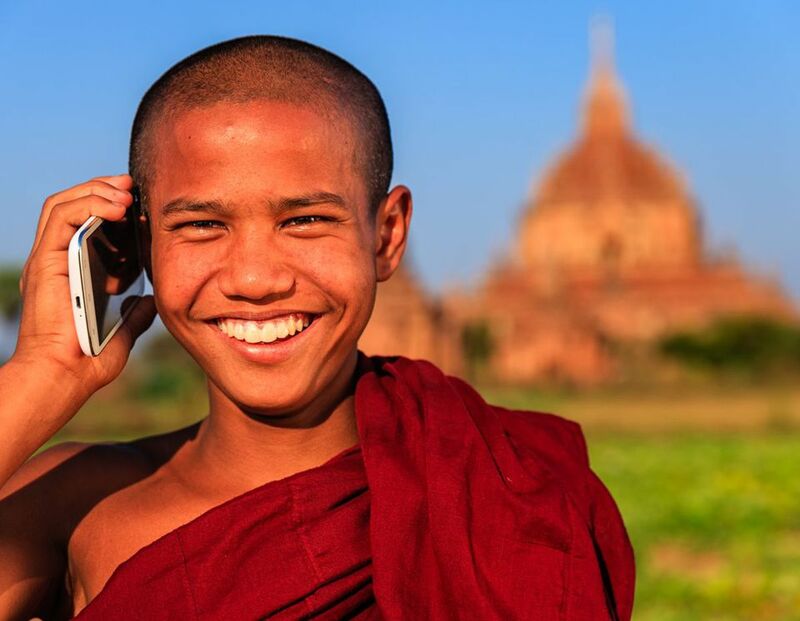 Cellphone roaming in Southeast Asia isn't just possible, it's very easy to do. Certain U.S. cellular phones and most European cellphones will work in Southeast Asia; if your phone meets a few conditions, you'll be able to call home on your own handset to tell the folks how you're handling your Vietnam itinerary, or check into Foursquare while viewing the Singapore Skyline from the Marina Bay Sands SkyPark. If your own phone doesn't play well with your destination's GSM network, don't worry - you're not altogether out of options. Can I use my own phone in Southeast Asia? GSM cellular standard. Not all cellphone providers are created equal: in the U.S., digital cellular networks are split between GSM and CDMA. U.S. operators using the GSM standard include AT&T Mobility and T-Mobile. US Cellular, Verizon Wireless and Sprint use the incompatible CDMA network. Your CDMA-compatible phone won't work in a GSM-compatible country. 900/1800 band. Outside the U.S., Japan, and Korea, the world's cellular phones use GSM technology. However, the U.S.'s GSM networks use different frequencies than the rest of the world. In the United States and Canada, GSM cellphones use the 850/1900 band; providers everywhere else use the 900/1800 band. That means a dual-band GSM phone that works perfectly in Sacramento will be a brick in Singapore. If you have a quad-band phone, that's another story: quad-band GSM phones work equally well on 850/1900 and 900/1800 bands. European phones use the same GSM bands as those in Southeast Asia, so no problem there, either. My GSM phone is locked to my home cellular provider - what next? Even if you have a GSM phone that can access the 900/1800 band, your cellphone may not always play well with local networks. Check with your carrier if your contract allows you roam internationally, or if your phone is unlocked for the use of other carriers' SIM cards. The SIM (Subscriber Identity Module) card is unique to GSM phones, a transferable "smart card" that holds your phone settings and authorizes your phone to access the local network. The card can be switched from one phone to another: the phone simply assumes the new SIM card's identity, phone number and all. GSM phones are often "locked" to one cellphone provider, meaning they cannot be used with cellular providers other than the provider that originally sold them. Having an unlocked phone is important if you want to use it with prepaid SIM cards from the country you're visiting. Should I roam with my current plan? Does your plan allow International roaming? Check with your phone operator if you can use your phone in Southeast Asia, and what services you can use while you're roaming. If you're a T-Mobile user, you can read T-Mobile's International Roaming Overview. If your phone uses AT&T's network, you can find the info you need at their Roaming Packages page. Be warned: it will cost you a lot more to make or receive phone calls while roaming abroad, to say nothing of using your iPhone to check into Facebook from overseas. Beware of push email and other apps tapping the Internet in the background; these can tack a few extra zeroes on your bill before you know it! CONS: Expensive, limited coverage; if you're browsing the Internet while roaming, you can rack up those data roaming fees pretty quick. Luckily, avoiding data roaming charges isn't that hard if you know how. My phone's SIM isn't locked - should I buy a prepaid SIM? If you have an unlocked quad-band GSM phone, but you think you're being stiffed by your provider on your roaming fees, you might also consider buying a prepaid SIM card in your destination country. Prepaid SIM cards can be bought in every Southeast Asian country with GSM cellular service: simply buy a SIM pack, insert the SIM card into your phone (assuming it's unlocked - more on that later), and you're ready to go. Prepaid SIM cards have a "load", or balance, included in the package. This balance is deducted as you make calls on the new SIM; the deductions depend on the rates included with the SIM card you purchased. You can "reload" or "top up" your balance with scratch cards from the SIM card's own brand, which can usually be found at certain convenience stores or sidewalk stalls. No unlocked quad-band phone on hand? No worries; you'll find low-end cellphone stores in any Southeast Asia capital, where you can buy affordable Android-based smartphones for less than $100 brand-new, and even less when bought used. What prepaid SIM should I buy? The region's major cities and tourist spots are mostly covered by each country's cellular providers. Southeast Asia's mobile penetration rate ranks among the highest in the world. Every country has a number of prepaid GSM provider to choose from, with a varying degree of bandwidths available. 4G and 4G+ connections are commonplace in digital economies like Singapore, Thailand and Malaysia. Even low to middle income countries like the Philippines, Cambodia and Vietnam possess advanced voice and mobile Internet networks clustered around these countries' urban centers. The closer you are to the cities, the greater your chances of getting a signal. How do I get Internet access on my prepaid GSM line? The great majority of the carriers listed in the previous section provide Internet access, but not all providers are created equal. Access to the Internet depends on the country's 3G/4G infrastructure; this writer was able to access Facebook consistently throughout a bus ride from Malacca in Malaysia to Singapore, but the same experiment was a bust when taking a ride from Siem Reap to Banteay Chhmar in Cambodia (signal petered out about an hour after leaving Siem Reap, with a short burst of speed as we passed the city of Sisophon). Getting Internet access on your prepaid line is generally a two-step process. Top up your prepaid credits. Your prepaid SIM will come with a small amount of call credits, but you should top up with an additional amount. The call credits determine how much calling/texting you can do from your phone; they can also be used as currency to buy blocks of Internet access, see next step. Buy an Internet package. Use your call credits to buy Internet packages, which usually come in blocks of megabytes. Internet use is generally metered in megabytes, requiring you to purchase a new package once you've used them all up. Prices depend on the number of megabytes purchased and on the length of time you can use them up before the package expires. Can you skip step 2? Yes, but as I learned to my distress in Indonesia, using your prepaid credits to buy Internet time is massively expensive. Step 2 is like buying megabytes at wholesale prices; why the hell will you keep paying retail?